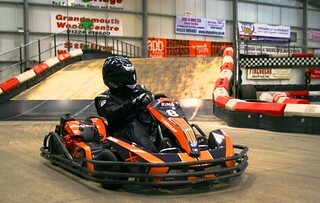 Effing awesome gokarting tracks a chicane away from the centre of Edinburgh : indoor & outdoor available. 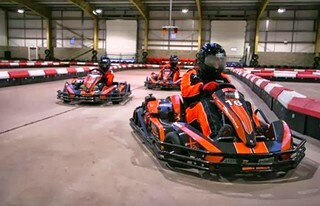 Go karting or Outdoor Karting is the best fun you can have with your clothes on and still burn rubber as you shoot round this outdoor 930 metre track at full throttle. Now is your chance to prove you are faster than Hamilton (and that's before you get in the kart) if only to show some of the boy racers/snails that have been your friends since they were knee high to a grasshopper that they are still pants at pulling a few G at the corners. The difference between outdoor karting and indoor is outdoor karts have twin engines and reach speeds of 70 mph. Now that's fast when you arse is only an inch off the ground and your heart is in you mouth. Nows your chance to follow through and race to the finish line first and leave them breathing your exhaust fumes. Where are the Outdoor Go Karting sites? All race wear is supplied other than the nappies which you might need at these speeds. The outdoor grand prix starts of with a safety briefing and supervised practice laps followed by the 3 heats. After this it is racing on to the grand final where the top drivers get presented with prizes. There does need to be a minimum of 16 or maximum of 32 Drivers and lasts several hours depending on party size. There is also an American style diner where you can fuel up after the racing. Wow! these are fast and will blast the cobwebs out the ears at 70 MPH and cause you cheeks to clench(all 4 of them). Once you have blasted round the track you wont want to stop but luckily you do have brakes but the accelerator is much more fun to burn the rubber. Not for Sunday drivers. If your not fast you will be last and get the piss taken out you that night. Don,t get pissed the night before or you wont get a chance to fill your pants at 70 MPH. At that speed you would blow a hole in them as you have a great kart. (Yes I did say kart). Get revved up about this day as it will be fantastic fun and will be talked about for months.